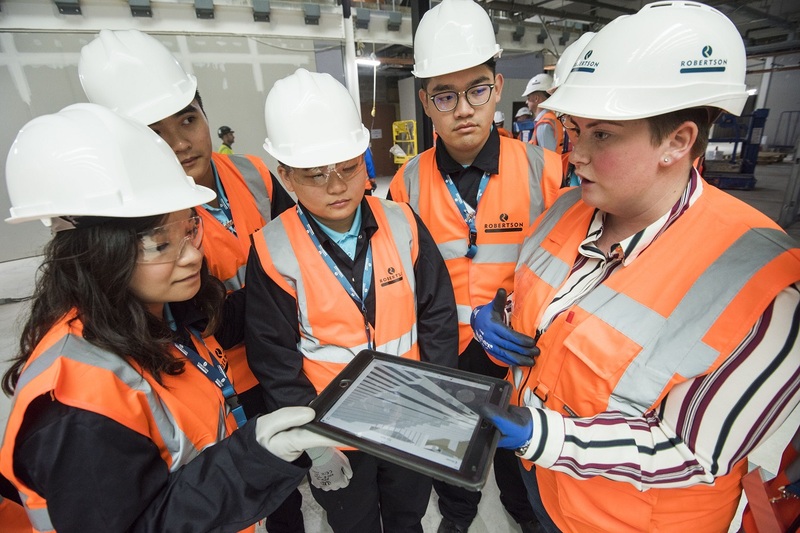 The site team from Robertson — which is delivering the new school at Bertha Park — welcomed the group of 15 apprentices from the Vocational Training Council (VTC) in Hong Kong. The group are visiting as part of a training programme delivered in partnership with Forth Valley College. They are studying a number of specialisms across the built environment industry and learning about innovations, technologies, building techniques and apprenticeships across Scotland’s building and engineering industries. Pictured above, Robertson intern Ailsa Howie (right) explains how digital technology is aiding construction at Bertha Park. As well as Bertha Park, the group also visited two Robertson sites in Edinburgh — the new £12m training centre for the Scottish Fire & Rescue Service at Newbridge and the £12.8m refurbishment of 10 George Street ahead of Standard Life Aberdeen’s move into the building. Andrew Campbell, International Development Manager at Forth Valley College added: “It’s fantastic that Robertson was able to support the site visits with each providing a great experience for the group. Robertson’s community development team ensure that all the work carried out brings lasting value to the communities served — actioned through understanding the needs of clients and communities and delivering engaging opportunities for local schools, colleges, universities, community groups, building users, project neighbours and other stakeholders.